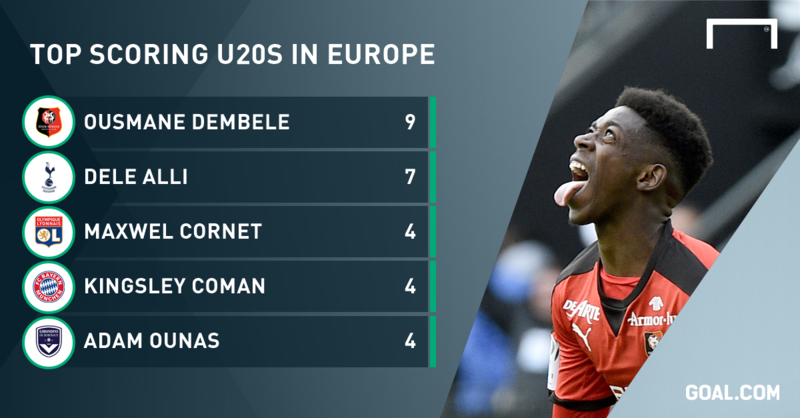 Timing can be everything in football, and so far 18-year-old Ousmane Dembele has proven that he has that quality in abundance. 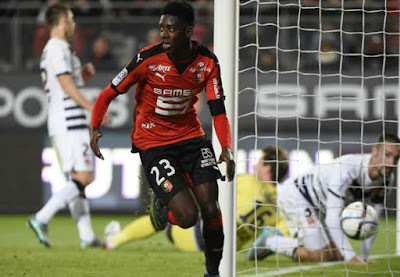 The Rennes star waited until the eyes of Barcelona’s chief scout and technical director were upon him to score his first senior hat-trick on Sunday – and as if that was not enough, it came in a spectacular opening 45 minutes against local rivals Nantes, during which time he virtually sealed the match single-handedly by leading his team into a 4-0 half-time lead. Head coach Rolland Courbis admitted he had thought about treating the youngster gingerly for that encounter and was “51 per cent” sure until a little before kick-off that he would be on the bench. How glad he would have felt for going against his instincts as the youngster obliterated their neighbours in a devastating opening period. Rennes expect great things from the prodigious attacker, who has barely played 20 hours of top-flight football since his introduction to the senior side with a five-minute cameo away to Angers in November. A fortnight later, he started and scored on his first start against Bordeaux, setting the tone for an outstanding breakout campaign. In total, he has found the net nine times and produced three more assists in what has been one of the most remarkable debut seasons in Ligue 1 in recent years. It is little wonder, then, that Barcelona are monitoring the Normandy-born player and seeking to steal a march on Arsenal to secure what could become one of the most precious signatures in the world game. Even Anthony Martial did not explode onto the scene in such an emphatic manner. While the potential of the Manchester United striker was clear during his time in France, his efficiency and effectiveness were not even close to that of Dembele, who has scored more times as an 18-year-old than anyone in Ligue 1 for over 25 years. 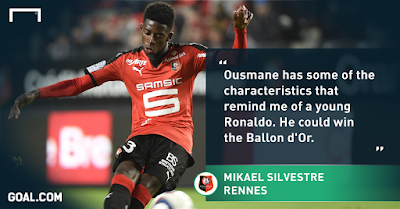 Indeed, Rennes sporting director, Mikael Silvestre, sees something very special in the young charge. Head coach Rolland Courbis has warned the player via the press that moving to a big club too early could “screw up” his career, and has said that “he needs a club like Rennes for at least the next two seasons”. Nonetheless, it would be difficult for the ambitious youngster to ignore the lure of Camp Nou or the Emirates Stadium. Playing professionally has always been a dream of the winger's, who used to take a ball with him when he went shopping. But his route to becoming a firm fixture in the Rennes squad has been surprisingly complicated in hindsight. Just as Paris Saint-Germain lost Kingsley Coman for a pittance to Juventus, Rennes were faced with the prospect of losing their young starlet for virtually nothing, with Manchester City and Benfica among the clubs seeking to pounce. It took the intervention of Silvestre last autumn for Dembele to begin his integration with the Bretons’ first team. Head coach Philippe Montanier considered him too small and too weak even to train with the squad, and as a result he initially refused to sign professional terms with the side he had joined as a 13-year-old. Dembele even boycotted a training camp in Germany in an attempt to further his cause before finally signing a three-year deal in October. Once given his chance, the teenager showed just how wrong Montanier initially was. Blessed with confidence and a wonderful affinity with the ball, he settled into his natural game from his very first moments in Ligue 1. Each time he received possession, he tried to be a catalyst for his side’s attack, spinning to run at defenders and showing no fear of shooting at goal when an opportunity presented itself. Equally, though, Dembele’s strengths can be his greatest weaknesses; a problem that has followed him since the earliest days of his footballing career. Now Ligue 1 defenders are faced with a similar dilemma. Experienced Albania international Lorik Cana was left particularly red-faced by the speedy youngster last Sunday, as he was turned inside out before watching a right-footed shot dispatched into the corner of the Nantes’ net. Dembele was deployed in the No.10 role last weekend, and Silvestre sees a future there for him, even if his most striking physical attribute - his pace - might suggest he would better utilised wide. “He has more freedom in the centre. He can put himself into situations where he can exploit the qualities we know he has,” the former Arsenal and France defender said after the match. Indeed, Dembele is such a fresh face at this level that it is not yet clear if his own coaches know how he best fits into their system. What chance do visiting defenders, who have little more than 1,000 minutes of footage to go on, stand? Greater challenges and tougher questions certainly lie ahead for the 18-year-old. The first of these will come in the summer, when he is forced to handle speculation over his future – not an easy task for a youngster who has a reported €30 million price tag on his head.